Bermuda’s flag flies over a monument erected at the former site of a top secret World War II [1939-1945] training school in Canada where spies, saboteurs and assassins learned their deadly tradecraft before heading into the field to fight for the Allied cause. 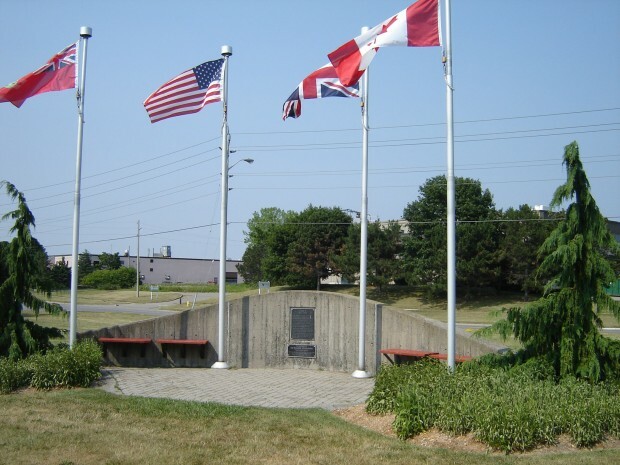 Camp X was the unofficial name of a Second World War paramilitary and commando training installation on the northwestern shore of Lake Ontario between Whitby and Oshawa in Ontario. The area is known today as Intrepid Park, after the code name of the late Bermuda resident Sir William Stephenson [1897-1989]. The Canadian-born industrialist and espionage chieftain headed the British Security Coordination [BSC] intelligence outfit from offices in New York’s Rockefeller Centre during the war. 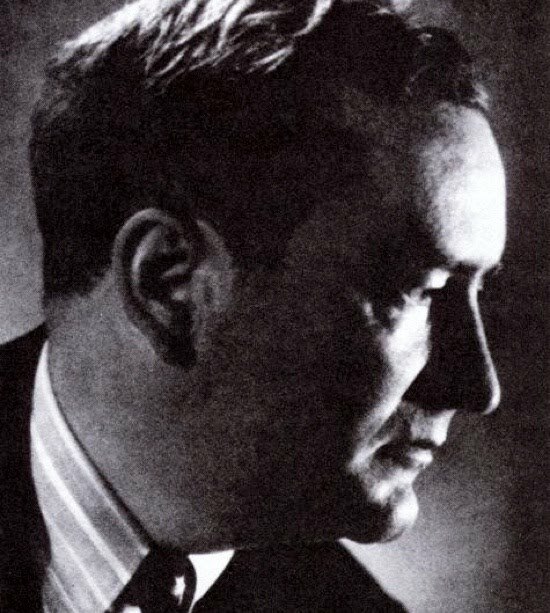 Appointed to his wartime post by British Prime Minister Winston Churchill in 1940, Sir William [pictured] — who moved to Bermuda in the early 1960s and lived the rest of his life here — was the senior representative of British intelligence for the entire Western hemisphere during World War II. Sir William’s initial directives for BSC were to investigate enemy activities throughout North America, South America and the Caribbean; institute security measures against sabotage to British property; and to organise American public opinion in favour of aid to Britain. 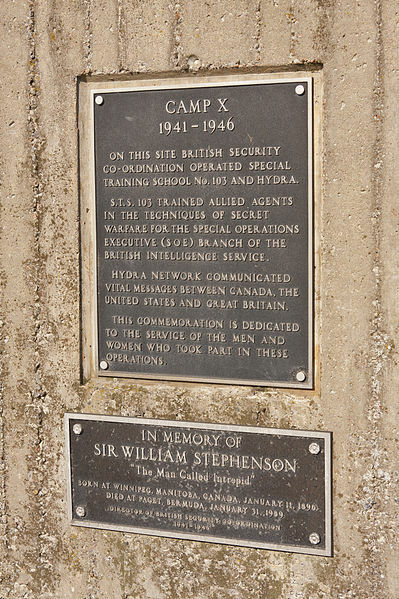 Camp X was established December 6, 1941 by Sir William Stephenson. The camp was originally intended to provide an unofficial link between British and American intelligence services at a time when the US was forbidden by the Neutrality Act to be directly involved in World War II. Operated jointly by BSC and the government of Canada, officials from the US Federal Bureau of Investigation and the Office of Strategic Services [OSS] — forerunner of the Central Intelligence Agency — secretly trained alongside Allied secret agents at Camp X before America’s entry into World War Two in December, 1941. Camp X pupils were schooled in a wide variety of special techniques including silent killing, sabotage, partisan support and recruitment methods for resistance movements, demolition, map reading, use of various weapons, and Morse code. It was at Camp X that the OSS operated an “assassination and elimination” training program that was dubbed “the school of mayhem and murder” by George Hunter White, who trained at the facility. The Camp X monument was unveiled in 1984. It is surrounded by four flags: Bermuda flag [where Sir William lived for many decades] and those of wartime Allies the United States, Britain and Canada. Today it is the site of annual Remembrance Day ceremonies hosted by 2 Intelligence Company, a military intelligence unit based in Toronto, Ontario. Sir William began to visit Bermuda during the war while en route to London aboard transatlantic flying boats which passed through the island; during his visits he would routinely liase with the British Imperial Censorship operation in Bermuda which was headquartered at the Princess Hotel. In the early 1960s he retired to Bermuda with his Tennessee-born wife Lady Mary Stephenson and the couple lived in a suite at the Princess for several years before buying a home in Paget. Described by James Bond creator Ian Fleming as “one of the great secret agents of the last war”, Sir William led a quiet existence here. Previously knighted by King George VI in 1946 and the first non-US citizen to receive the Presidential Medal of Merit by President Harry Truman, Canadian Governor General Ed Schreyer travelled to Bermuda in 1979 to invest Sir Wiliam with the Order of Canada — his native country’s highest civilian honour. Sir William died in Bermuda in 1989 at the age of 92 and is buried at St. John’s Church, Pembroke.